HomeAbstractWorlds Fastest 75mm Lens. 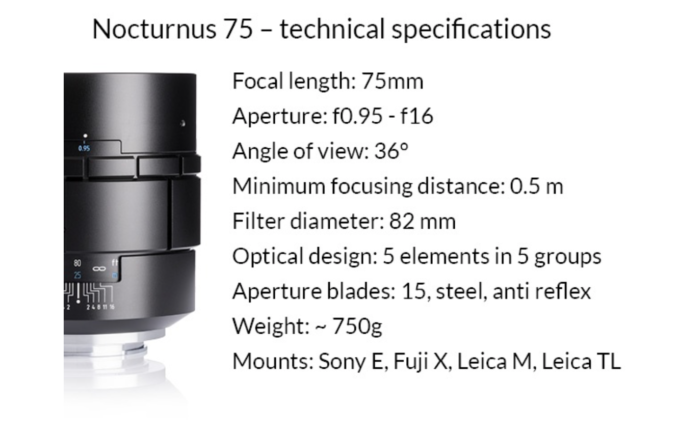 The Nocturnus 75 f/0.95 announced. 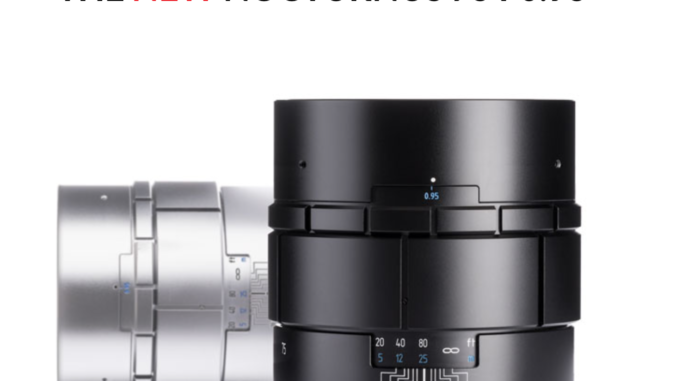 Just an FYI for all of you fast prime lens lovers out there…Myer Optik has announced the worlds fastest 75mm lens and for the next 18 days they are pre-selling them at 50% off, which saves you $1999. They have 28 units left in this special promotion, and the lens ships in April of 2019. 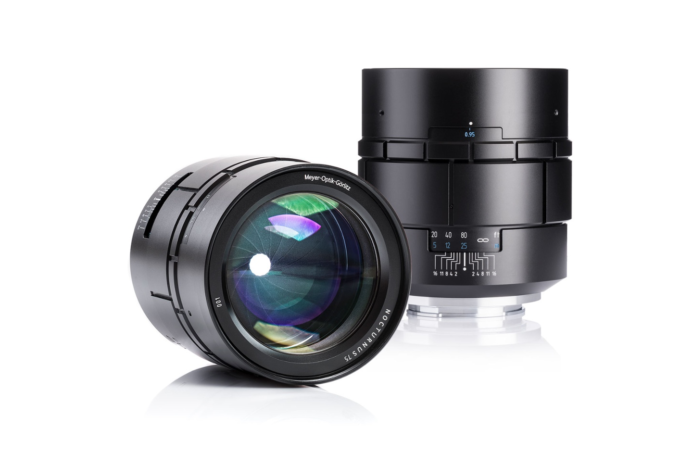 According to Myer Optik this will be available for many mounts, just as their 50 f/0,95 Nocturnus was (my review HERE). Sony, Leica-M, Fuji X, Leica TL…. These lenses lean on the artistic side of the spectrum IMO. VERY shallow depth of field, big bokeh and usable in just about any light. I have not seen or touched a 75 Nocturnus but the MSRP will be $3999 when it is released, so to those interested it seems you can get a great deal if you order now. 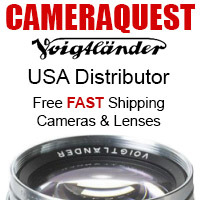 You can check out their page for this lens with photo samples, more specs and info and even a video. Check that out HERE. Won’t be buying one, but I’m impressed. Good to see companies pushing the optical envelope. My issue is that having and and sold a Leica APO 75mm f/2, this lens will be equally challenging to focus on a rangefinder without using the external EVF. Yes, you can do it with zone focusing and whatever, but as a lens “to get your money’s worth,” it is a challenge for the rangefinder purist crowd. 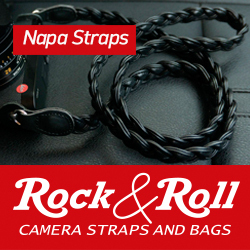 If using that external EVF is no problem, then I’m sure it is worth it. It’s s 5-element lens. Doesn’t bode well for any serious degree of correction. One could wonder why Meyer Optik bothered to mount no less than 15 aperture blades, when most of our readers are shooting wide open anyway. I can tell you lens NEEDS those 15 blades, because the dof can get so bonkers and over the top shallow, especially when focusing at 50cm distance, that in so many cases, one will want a larger zone in focus, fore which they will want to stop the lens somewhat down. The 15 blades are the only way to provide nice round bokeh, when stopped down. Hence the necessity for it, since the need to not always shoot wide open will occur pretty soon (for those that are looking further than just an effect.) Many images would get over the top too fast blurry and if not focused with the absolutely utmost care, the image will get a lot softer.No problem for many characteristic street shots, but still loosing lots of detail. By taking the diameter of the front glas element in relation to the filtersize, I get to the a max. Aperture of a 1.2/75 mm lens. If I am wrong please tell me. So comparative to the f1.4/85 mm GM lens with AF. This is the new ‘inflation’ – along with filling the box of cereal half full, or making the candy bars and ice cream cartons slightly smaller. Maybe we should only talk about T values from now on – no bs if you measure the light transmission. Otherwise, does a digital sensor even see the wider cone of light of f0.95? i.e., does the sensor well accept that angle? I can say that with the old 50 f1 CANON EF lens, the mirror box blocked part of the f1 aperture. The test with a digital camera would be to photograph a star with the lens set at 1 meter and compare the size of the out of focus image (circle of confusion) at various apertures, also noting the image intensity – and maybe compare to another lens of the same focal length. The other question is whether the lens is actually 75mm to begin with – maybe it’s really a 65mm fl. Thank you Mr. Pfeiffer for your excellent observation. Would be so cool on a Pentax KP & Skytracker! Poke Meyer for me and ask for their lenses in a Pentax Mount!